Static websites are passé. But dynamic websites are not extraordinary. They have become pretty basic. In addition to dynamic features and responsive designs, a website has to be highly interactive. Any website that is not engaging, doesn’t entice the audience and fails to offer any kind of interactive or virtual correspondence would fall flat and have little or no impact on the visitors. No matter what type of website it is or what the primary purpose is, a website should be interactive. Thus, it is imperative for you to look for some of the best free interactive WordPress themes. For your convenience, we have listed some of the best free interactive WordPress themes here that you can check out and get started with. This theme is one of the liveliest themes out there right now and it has an interactive contemporary interface. It is responsive, loaded with colors, plenty of customization options including layouts, homepage headers, animations and parallax effects. Responsive Boat is ideal for corporate websites, digital studios, small to medium businesses as well as for web agencies. 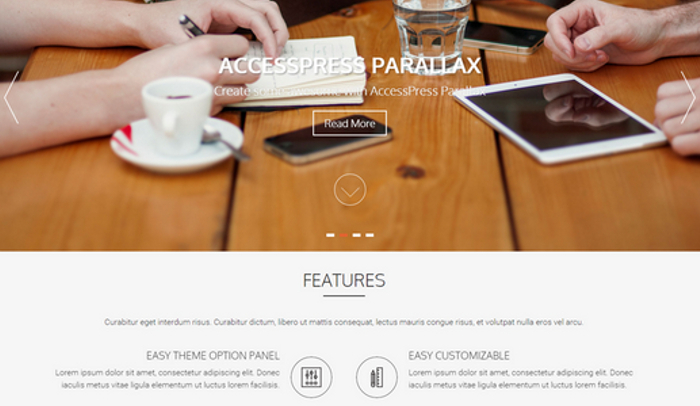 This theme is one of the simplest of all our best free interactive WordPress themes. It has a very playful design, some really nice animations and it also comes with a parallax effect. The interactive interface of the website offers an amazingly smooth transition and that makes browsing effortless. This theme is a completely responsive theme, apt for all browsing devices. It creates a fine balance between visual and textual content. The theme comes with several sliders, animation effects, navigation elements, a grid like system and sufficient room for customization of headers, logos, colors and backgrounds among others. It is retina ready, has hundreds of fonts to choose from and is compatible with all relevant plug-ins and widgets. All the elements on every webpage you develop with this theme will be as interactive as a website can get right now. 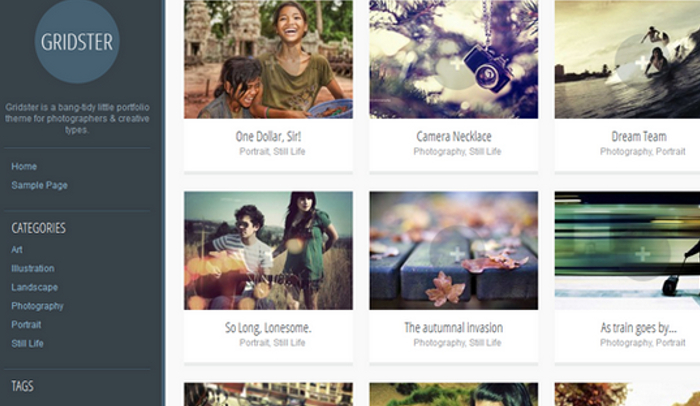 This theme is one of the more popular on our list of best free interactive WordPress themes. 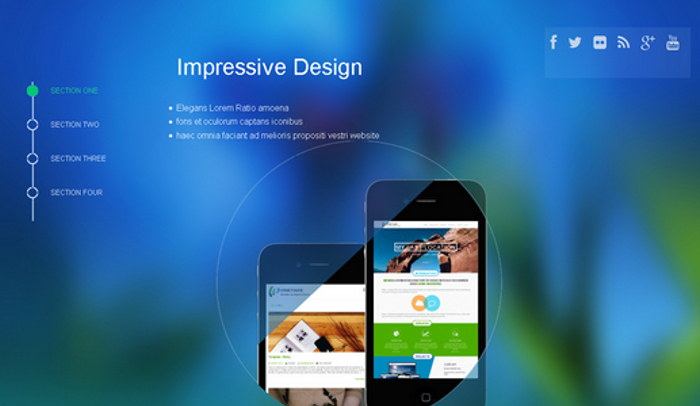 Apart from the parallax and 3D effects, the theme is responsive, engaging and it makes browsing a cakewalk. An integral part of any interactive website is the ease with which one can navigate and check out everything that the site offers. This theme facilitates that with élan. This theme is a cool, contemporary and responsive theme with a highly interactive WP customizer interface. It is just as interactive for the developers as it is for the audience. Artists need a special way to express themselves. While that is within the forte of an artist, presenting oneself in a unique way is also quintessential. That is not exactly the expertise of every artist. You could be a singer, musician, painter, writer, photographer, filmmaker, sound engineer, illustrator, designer or dancer. Every art form requires a relevant approach to its presentation and thus an artist should choose a website or its theme wisely. Given the fact that any artist will have to be present online and should ideally have an exclusive website, one has to look for a few best free artist WordPress themes. Here are some of the best free artist WordPress themes that you can consider. This theme is for writers. It can also be used by bloggers penning down their thoughts pertaining to any topic or context. 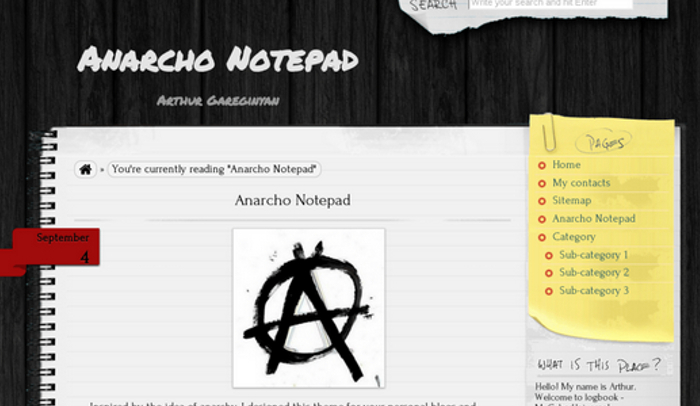 While inspired by anarchy, the theme doesn’t aim to instill any form of anarchism. It just makes presenting of what you have penned stylish and cool. The design of the theme is earthy and you can customize it anyway you want. It is good for diaries, personal blogs and even ideal for poets, lyricists, novelists and playwrights. The theme supports translation so a writer can reach out to more than one’s immediate target audience. 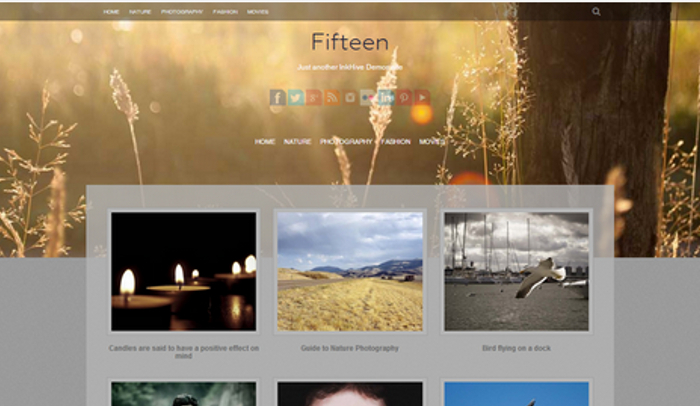 This theme is obviously for the photographers out there and also for those who work on portfolios. Despite the name, the theme can be used by painters, illustrators, designers and even apparel makers. The theme is responsive. It is retina ready and is compatible with WooCommerce. 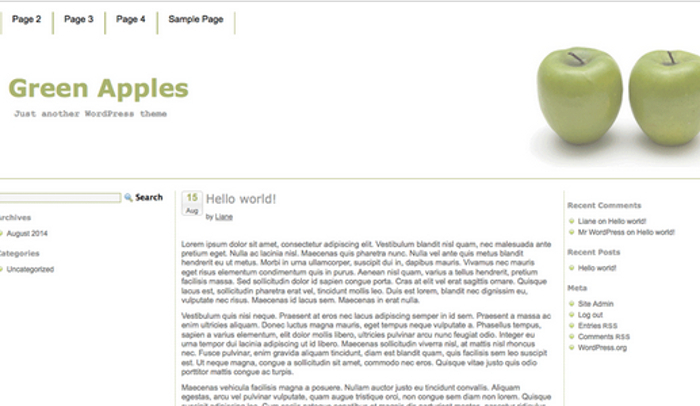 You can customize the design, navigation, footers, widgets, pages and it is translation ready. This theme is for any artist who is serious with his or her works. The immersive design does enough to entice an audience right from the slash page. Whether you are hosting a portfolio or you wish to develop a site that is more than just a blog, Fifteen will get you there. The theme is developed on CSS3 Framework and HTML5, it is responsive, there are archive pages, grid layouts, custom widgets, featured images, cool animations and it is translation ready. The theme already has preloaded German, Spanish and French language files. 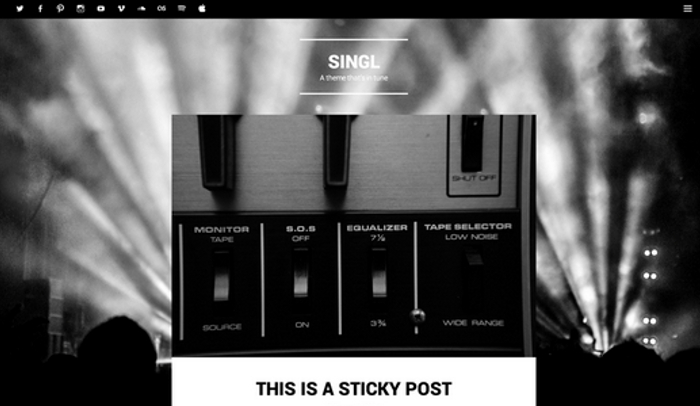 This theme is for musicians, singers, lyricists and also for music labels. The simplistic yet immersive design is powerful and the flexibility of the theme does the rest. There was a time when drag and drop builders had been hailed as path-breaking and sort of became a fad. 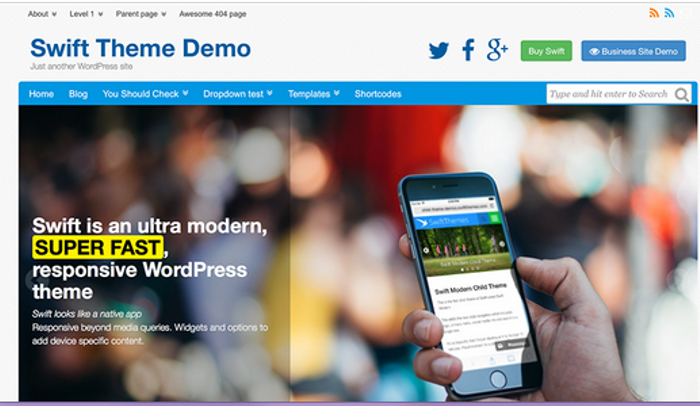 Most website developers, graphic designers and webmasters wanted the best free drag and drop WordPress themes. Today, the drag and drop feature has become rather commonplace. But there are still themes and templates that are not worthwhile despite the facility. You don’t just need a feature for the namesake if there is nothing more to it. The theme still needs to stand out, there has to be endless scope of customization and the drag and drop feature should facilitate the whole web building process. It is not just a fancy convenient feature but a rather integral one that makes the whole experience quick, easy and simple. Here are some of the best drag and drop WordPress themes. The Quest theme is a stunning theme. It is simple but cool. It combines the practice of large featured image with snippets and smaller featured images in a fine manner. You don’t need to be a coder to work with this theme. It has a drag and drop builder which offers you unlimited customization. The customization options are very easy to understand. 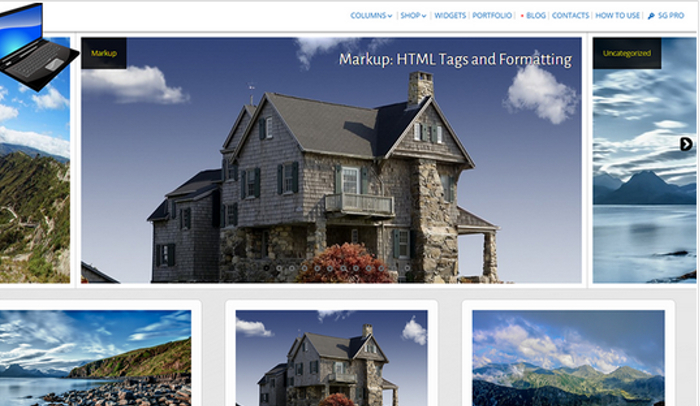 You can work with the colors, background images, colors, layouts and navigation among others. The theme is designed with a mobile first approach so not only would your theme and thus the website be responsive but it will look spellbinding on mobile devices. This theme is a responsive theme with drag and drop homepage sections. It has a minimalist design and that is what makes the website effortless to browse. The theme comes with width and boxed layout, featured posts, featured slider, projects layout, blog layout, testimonial layout, social media integration and several other layouts including call to action. The theme is compatible with WooCommerce, bbPress and RTL. It is translation ready, compatible with any browser and is ready to be optimized. This WordPress theme is one of the best free drag and drop WordPress themes when you consider its support. It is a multipurpose theme ideal for business websites, portfolios and blogs. The theme is responsive, has a drag and drop builder and you can customize everything from the meta-sliders to the sticky menu. With the right choice of images and interesting content, the website can be truly engaging and the smart optimizations will help it steer ahead of its competition in the fight to gain search engine dominance. Style is subject to personal preferences and perceptions. It will never have a universal definition and what’s stylish and what’s not, will never have any unanimity. Hence, it eventually boils down to what you are impressed with and what you regard as stylish. 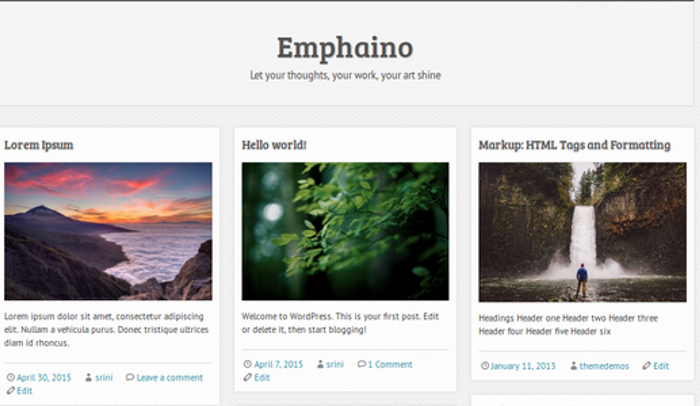 There are countless stylish WordPress themes out there. Many are free and many have to be purchased. You cannot really pinpoint any particular set of themes as more stylish. The type of website you are developing will also play a role in defining the standards that will determine if a theme is stylish. Regardless of the type of website you are trying to develop and what you would deem as style, here are some of the best free stylish WordPress themes. 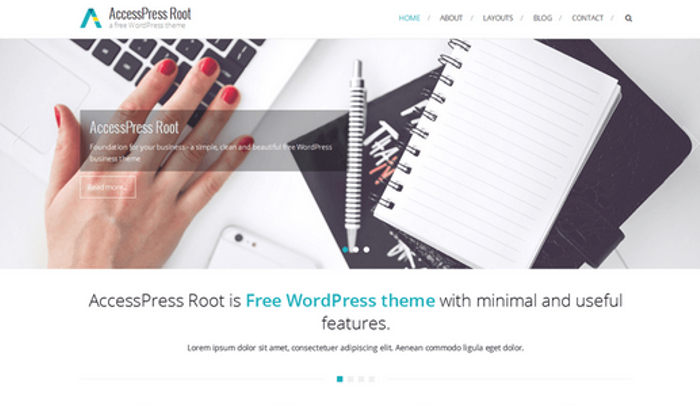 This theme is undoubtedly one of the best free stylish WordPress themes. Any template or theme can appear to be stylish by the virtue of the header image or the slash page. But the image alone doesn’t determine style. The website or the theme itself has to be stylish. One of the quintessential elements of that is the layout and how interesting it is. The users should have a nice experience browsing the site and that is what Gazette does. It has a minimalist style but with its effortless layout and navigation, it stands out among the rest. This WordPress theme is one of the more contemporary designs and anything that’s contemporary is stylish. 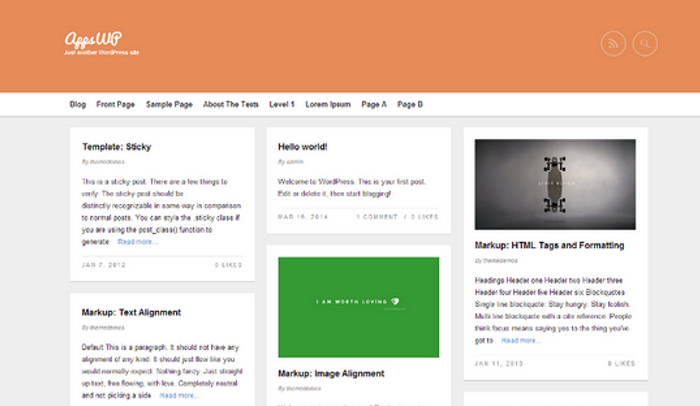 The focus on content and images with due attention to members or users of the site makes this theme desirable. The theme doesn’t require any coding whatsoever, there are social media integrations and the entire theme can be customized, right from the home page to the favicons, colors to the sliders and how they work. 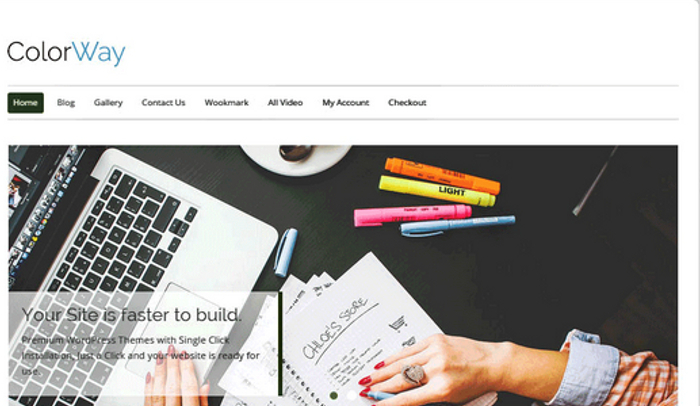 i-Max is one of the best free stylish WordPress themes for businesses. Most websites that are focused on the style quotient tend to be for bloggers, artists, designers and for portfolios. 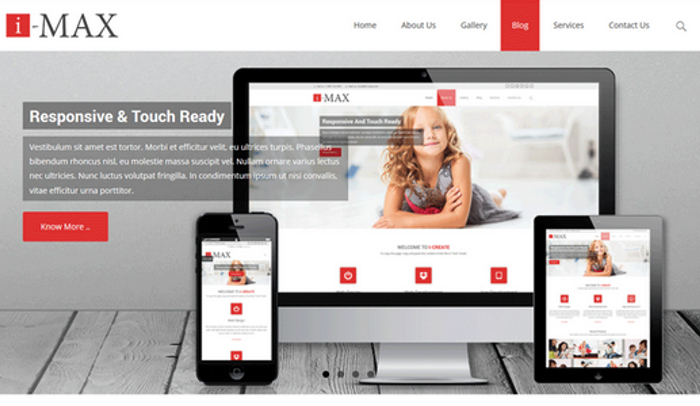 The i-Max theme is for companies. The boxed and wide layouts, custom backgrounds, social media links, unlimited color options, plug-in compatibility and all necessary features on every webpage, from testimonials to call to action widgets; the theme ticks all the checkboxes. 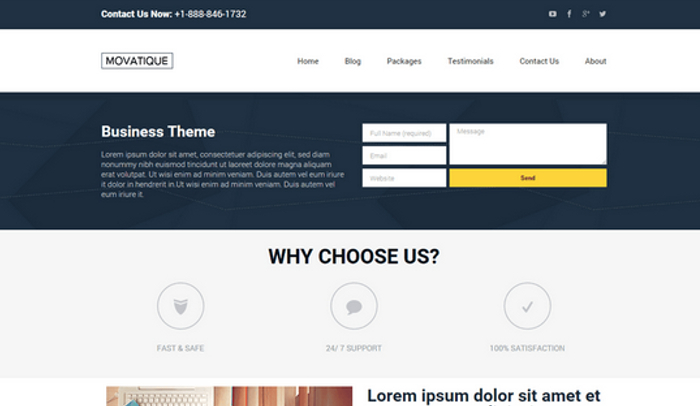 The Single Page theme is one of the best free stylish WordPress themes simply because of its teasing design. The interface is immersive and it just manages to draw in the viewer to check out more that’s on the site. Record label websites need to be truly compelling. They need to be immersive and there should be an equal focus on graphic elements as well as content. No fan wants to read stuff without a dose of images and the contrary is also true. There should be a fine blend of immersive design and informational content. But that is still a manageable quest. The real trick is to develop a truly unique website that stands out. A record label may have a certain philosophy or guiding principle but it will feature and promote many artists and thus the theme has to be appropriate for all kinds of productions. That is why there is a dearth of free record label WordPress themes. If you look around, most of the finer themes are only available when you decide to shell out fifty bucks or more. However, there are some free record label WordPress themes that you can work on and develop a compelling website. Here are a few of the best free record label WordPress themes. 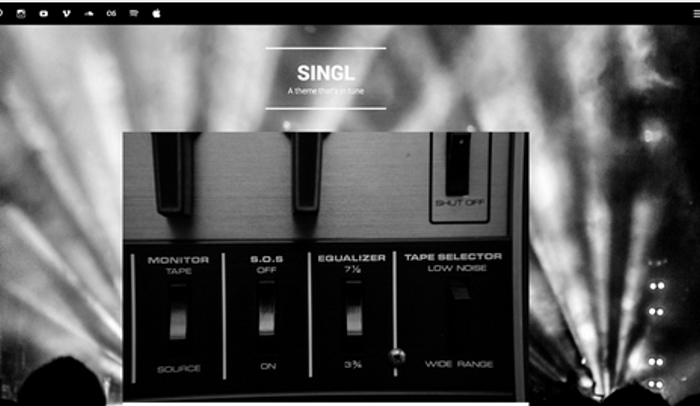 This them is an ideal theme for record labels and also for musicians. While this theme can also be used by other professionals, particularly artists, yet the focus on the primary image, the presentation of the landing page and all other features are engrossing enough for a music label. The featured image can actually be that of the featured artist for the time being and it can consistently promote whoever needs to be promoted. The Byblos theme comes with masonry grid tiles for posts or blog entries, there’s a vertical menu layout, you get numerous fonts, CSS3 animations and the theme is responsive. 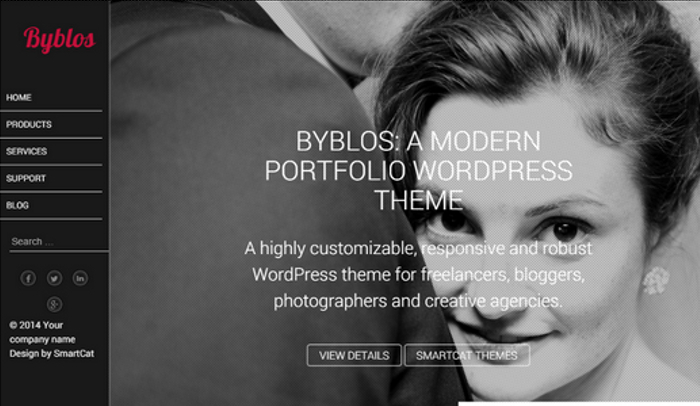 From tweaking the sidebars and headers and footers to installing widgets, plug-ins and getting analytics support, the Byblos theme will do and support everything that you need today to run a successful website. Music is a simple theme with minimalist design and some otherwise typical musical elements but it is in this simplicity that the theme shines. You can however work on any kind of change you want. The basic two column layout and the complete list of standard web pages or sections would be good enough to get started. 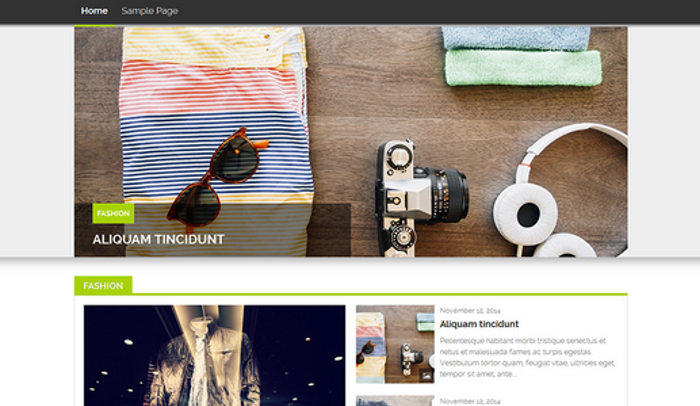 This WordPress theme is a stylish and contemporary theme. It is one of the most beautiful free record label WordPress themes. It is flexible, responsive, you can optimize the site and the artists will get duly highlighted through the interface of the website. There are hundreds of different layouts that you can work with while developing a website. One of the most effective layouts is a grid. A grid pattern or contents displayed as grids tend to offer visitors quick overview of what’s on the website. From featured posts to what’s popular, what the website owner wants to promote to engaging an audience with interesting and correlated content, everything is possible with one of the best free grid WordPress themes. But a grid like display cannot be at the cost of compromises on other features. You need the standard and some advanced features nicely blended into the grid like layout or pattern of display.Here are some of the best free grid WordPress themes. 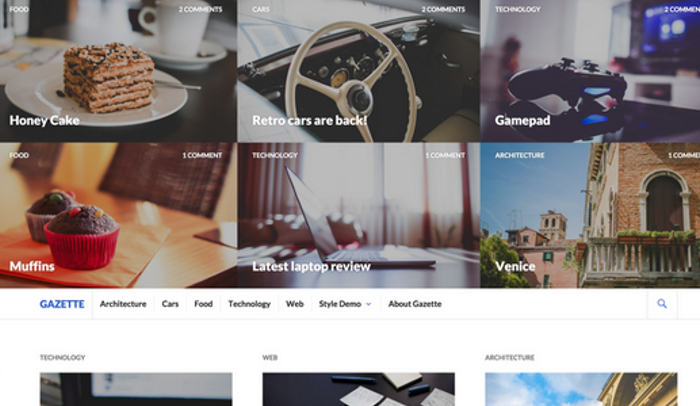 This WordPress theme is one of the best free grid WordPress themes. Very uniform grids with neat blocks of rows and columns, you can customize the rows and columns as well as the font or sizing of the grids, you can work on the sidebars and the entire layout. You can use any kind of widget you want as the theme is compatible with a host of plug-ins. You can work on the background, header, footer, navigation menu, fonts and everything you can think of while developing or tweaking a theme. This theme is apt for any kind of website that will benefit from a gridded display, from ecommerce stores to portfolios and more. Gridsby is an otherwise simple theme but when you look at its relevance in the era of Pinterest and Instagram, you would realize its significance. The design is simple, the layout is immersive, the splash page is ideal and you can truly entice your audience with a nice collection of images or even videos. 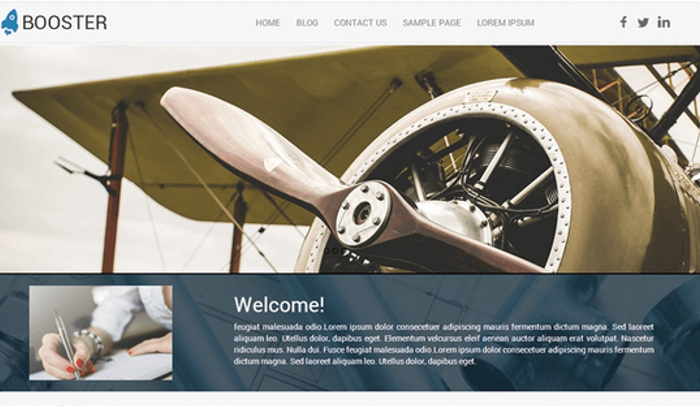 The theme is retina ready and is responsive. 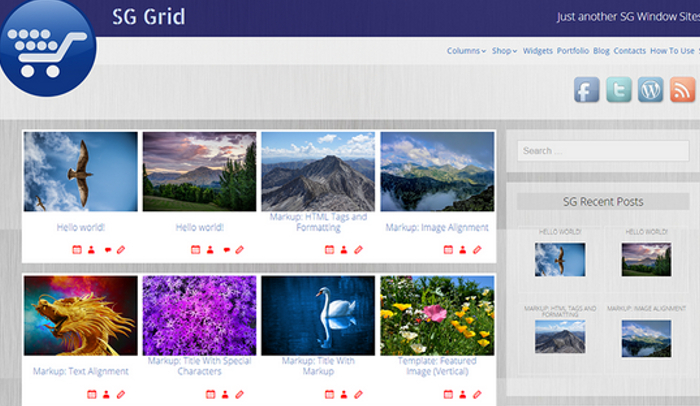 Having a front page gallery has never been easier and you can do it conveniently using Gridsby. 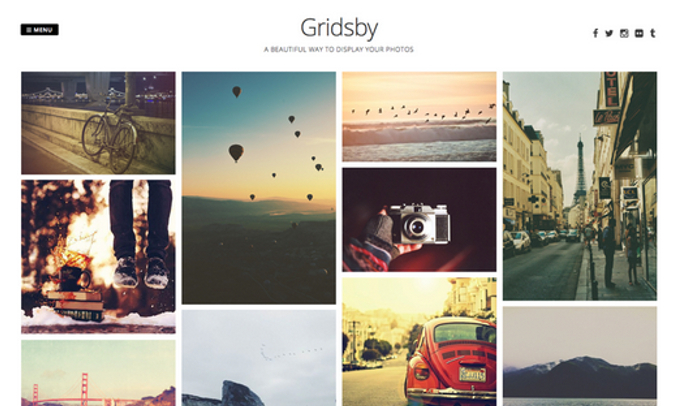 This WordPress theme takes off where Gridsby lets go. While the latter goes the whole distance with images, Gridster finely combines images and content. You cannot really optimize a site with images alone. You do need textual content. You can find the ideal blend of the two with Gridster. It is a responsive theme and has a grid based splash page or home page. You can then have any kind of layout you want on the subsequent pages. Gridz is heavy on content. It is in contrast to the otherwise focus on images when we talk about free grid WordPress themes. This makes the theme ideal for blogs and even corporate websites. The era of the homepage is over. This is the age of landing pages, or what is also known as a splash page. Whether you are working on a business website or a blog, an ecommerce site or a portfolio website, landing pages are more than just a trend. They offer an immediate overview to the visitor and yet the page is not overwhelmed with information. It offers a sneak peek and entices the visitor to check out the website, thus accounting for a footprint and also indicating the traction of the overall optimization of the website. At a time when back links and optimization determine and drive traffic, you ought to use a splash page WordPress theme. 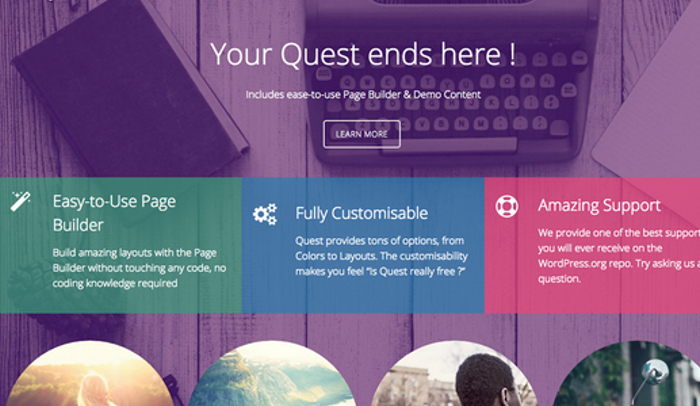 Here are some of the best free splash page WordPress themes that you may consider. 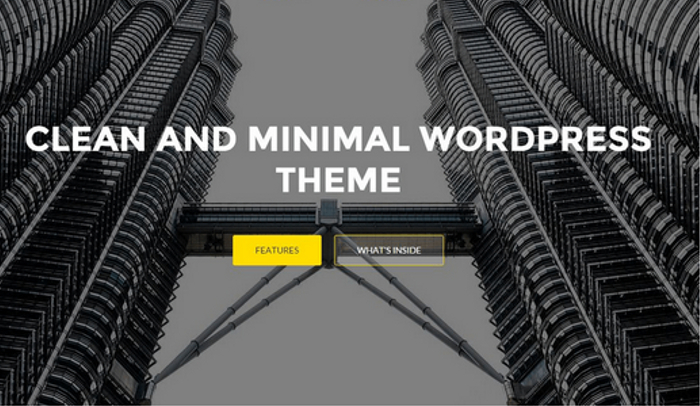 This theme is one of the most feature rich themes available on WordPress. The fact that it is highly apt as a splash page theme is perhaps just a bonus. 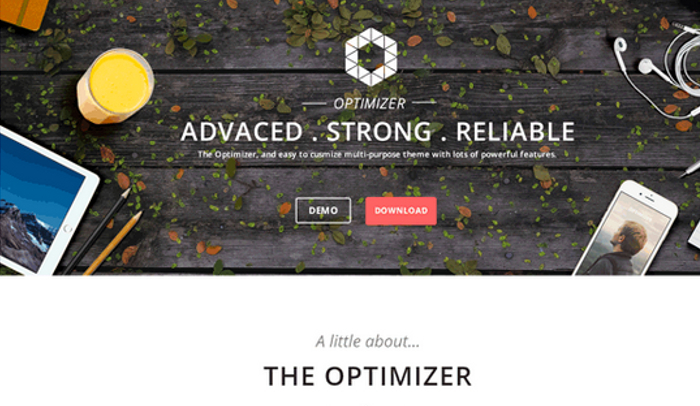 The Optimizer comes with a multipurpose theme that is entirely customizable and making changes is just as easy as a drag and drop. You don’t need to write a single line of code. There are full width layouts and boxed layouts, more than six hundred fonts, numerous effective theme options, color choices and CSS Field. The theme is responsive, it is easy to optimize with some preloaded SEO features and is retina ready. Built with HTML5 & CSS3, this splash page WordPress theme is ideal for small to medium businesses, corporate websites, personal blogs and ecommerce among others. The Stained Glass theme is another amazing splash page WordPress theme. It comes with a responsive design, has customizable sidebars, layouts, width of columns, easy navigation, featured sections for products, posts or portfolios, widgets for social media icons and any other integration that you may want, scroll animation, favicons, Google fonts and is compatible with a host of plug-ins. It is also translation ready. 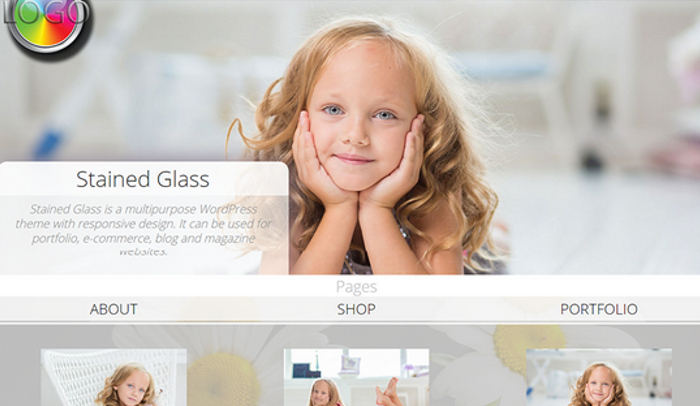 With Stained Glass, you can come up with an immersive splash page WordPress website. This WordPress theme comes with several layouts and a responsive design, one page navigation menu and theme customizer. You can work with the CSS3&JQuery effects, per page sidebars, different color schemes, layouts, custom widgets and more. It is easily one of the most apt splash page website themes for blogs, portfolios, ecommerce and business websites. When you use a theme or a template, you have three options. You can get a theme or template that you would use just as is. You may also get a configurable and customizable theme which you can work on and come up with your unique elements. In some cases, the two options are not the best choices. 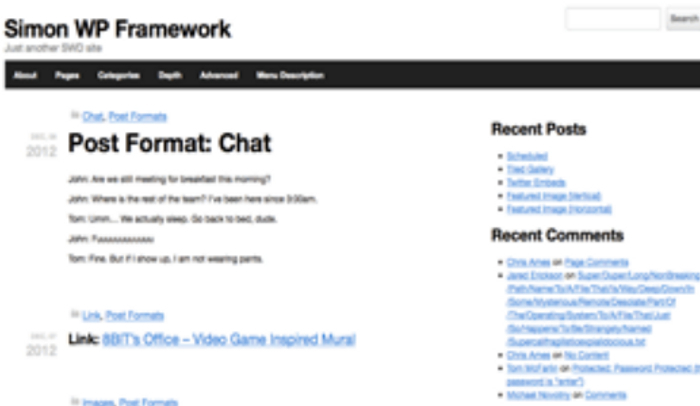 You may need a blank WordPress theme. With many people, it so happens that they begin to associate a theme or template with the particular images or content that has been presented. The context becomes inseparable from the theme. It is quite possible that the theme or template would only be great in that context and when you try to customize it or configure in your own way and in your own context, the whole thing becomes rather odd. If you have to work on a truly unique website, you may want to use some of the best free blank WordPress themes. 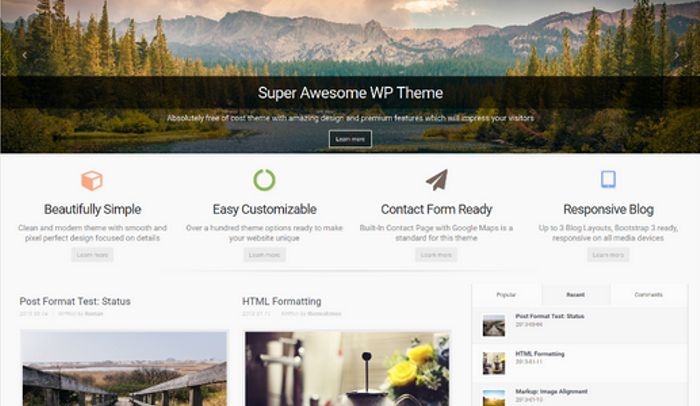 This theme is one of the finest themes out there that you can work on from scratch. You don’t really need to be an excellent coder because the theme has enough easy ways to go around doing your thing. Blank Slate is obviously clean but it is also minimalist, allowing full freedom to developers or designers. The foundation is there and the designers can weave their magic, either for their own sites or for their clients. 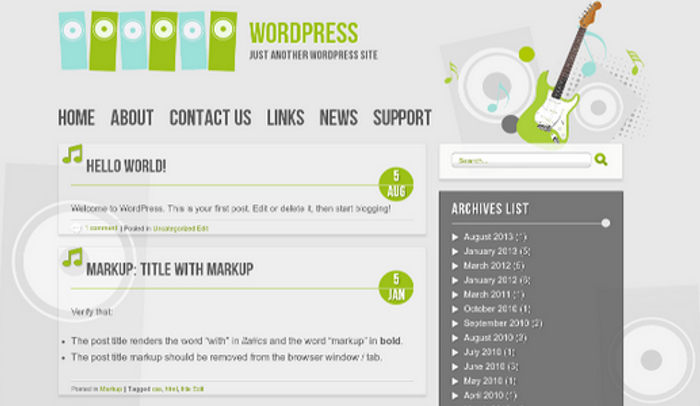 This WordPress theme is one of the simplest blank WordPress themes. It is presently available in HTML5 and its latest version is available as a boilerplate using the BlankSlate platform. Urban Square ticks all the checkboxes of typical themes but it doesn’t walk that last mile to give you definite sneak peeks at what the site may eventually turn out to be. That is up to you. So you get the layouts, the background image sections, colors, menus, sidebars, headers, footers and widgets among others. But you have to work on each of them to actually display what you want to put up there. The Customizer of Urban Square is a great deal of fun and convenience. This theme is another simple, clean and minimalist theme with everything you need. From custom icons to footers, sidebars and widgets, being responsive to having a wide array of typography, you can pick and choose whatever you like and make a unique site. Graphic designers love toying with new ideas, unique features and styles that people have not seen yet. That is what segregates graphic designers from ordinary web designers. The latter would simply comply with the trends and do what is necessary to develop a website. Graphic designers will stretch the limits, test new waters and will want to chart a course that has never been treaded. Some graphic designers love to start with a blank slate. Others want a basic layout or foundation in place upon which they would build their own elements. No matter what approach you want to take, there are enough WordPress themes for graphic designers to realize their vision. Here are some of the best free WordPress themes for graphic designers. This theme is not one of the most expansive or innovative themes but at times you need a few basic foundations to get started. Hannari is a flexible theme with a simple interface. 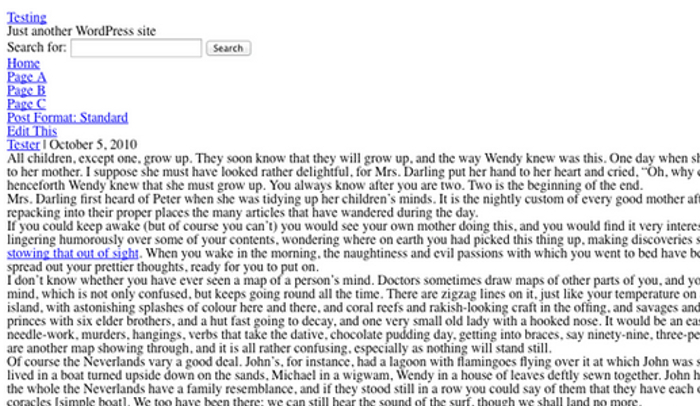 The theme is responsive and looks rather cool. From the liberty to create multiple sidebars to several theme options, there’s enough room to play with. 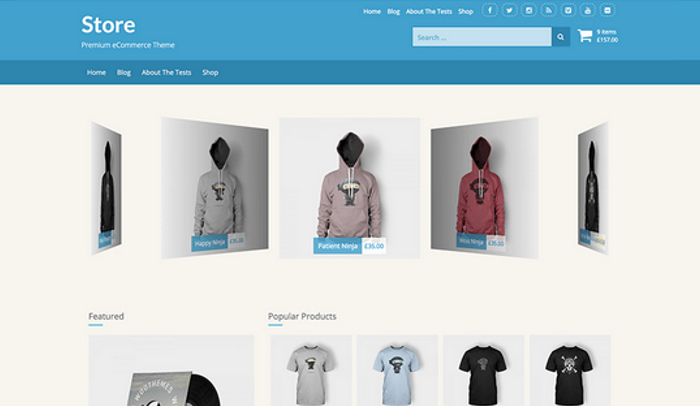 Store is an amazing WordPress theme. Graphic designs love working with ecommerce stores or websites that have online stores. The inventories, multiple sales and information pages, the landing pages and the busy yet simple interface allowing interactive features to the users make for a great ride. Store is the theme that any graphic designer would love to work with when one’s working on ecommerce sites. From featured product showcase areas to multiple layouts, advance menu, featured images, easy navigation system, configurable sidebar, 3D effects, stunning animation to being responsive, this theme is exactly what you need to get started with designing an online store. 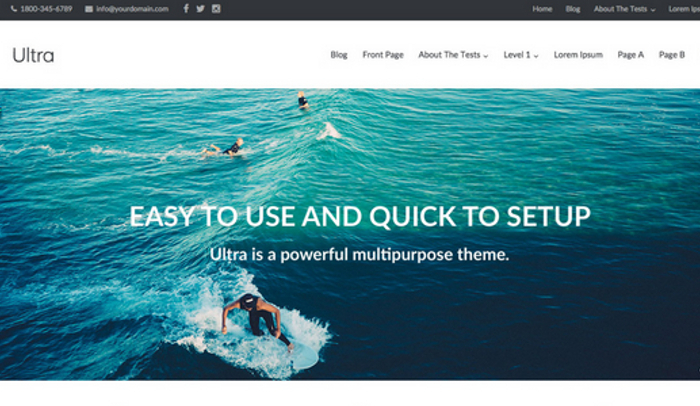 This WordPress theme is one of the fastest loading themes right now. But it is by no means a simple website. It has some of the most advanced optimization features. It is developer friendly with a ton of customization of options and most of them are intuitive and not outright generic. There are practically infinite possibilities with the layouts. The Colorway theme looks beautiful and more importantly elegant. Yet, it is simple. The customization options are very easy to use. Graphic designers can do everything, from having unique logos to toying with the backgrounds, using analytics and all major installations can be done with just a single click. Using the internet to promote your hair salon is just about a necessity in today’s competitive market place. Of course to really have the impact that you hope to with your website you have to choose the right theme. Creating a website for your hair salon can be easy if you choose to use one of the best free hair salon WordPress themes. You want to choose a theme that will showcase your business and your talents so you want a theme that has a portfolio section. Having a portfolio section will make it easy to upload pictures of all of your prior work. 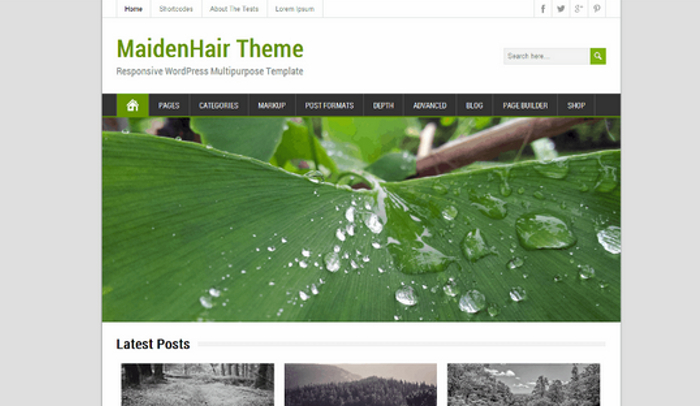 Some of the best free hair salon WordPress Themes are listed below. Booster is an easy to use WordPress theme that can easily display your work and provide visitors information about your website. This is a clean easy to use theme that is completely responsive which means that all of your guests will be able to view it on all of their devices. 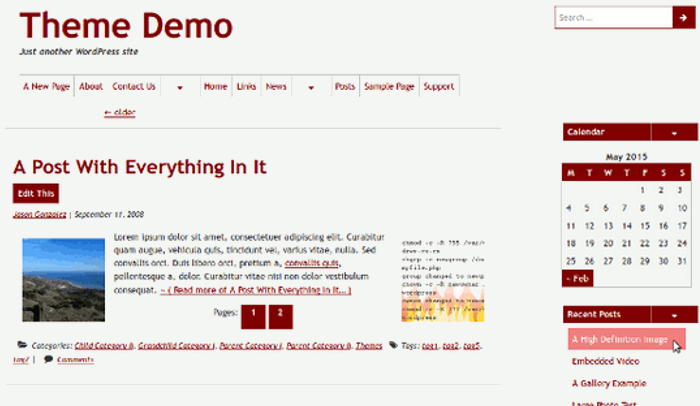 It is a great theme for the inexperienced designer that does not need a lot of features. CW Business Lite is an easy to use simple business design that is ideal for any service type industry. 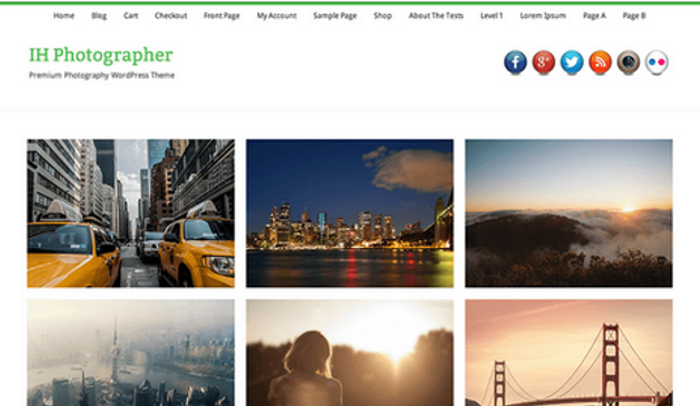 This theme offers everything you need to set up a great looking website and more. It is full of the most wanted features without having an overkill on the features. It is a great easy to use option that looks professional and polished. It is completely responsive which means it is ready to be viewed on any device. 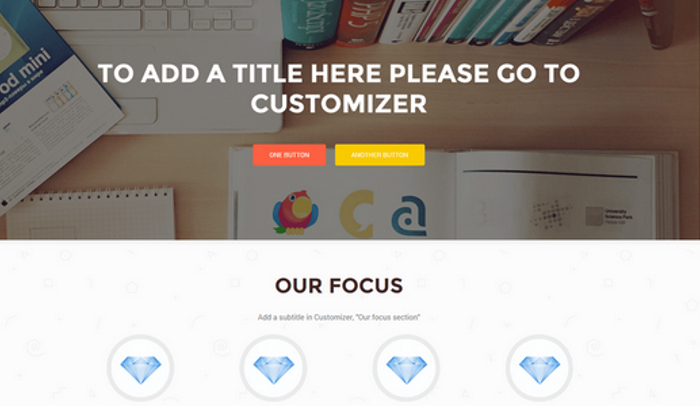 This theme is a rich theme that comes with full features. It offers a full range of color schemes to choose from and a host of ways to customize. It is an ideal theme for anyone that wants to build a large site but it is also great for smaller sites as well. It is available in several different languages. 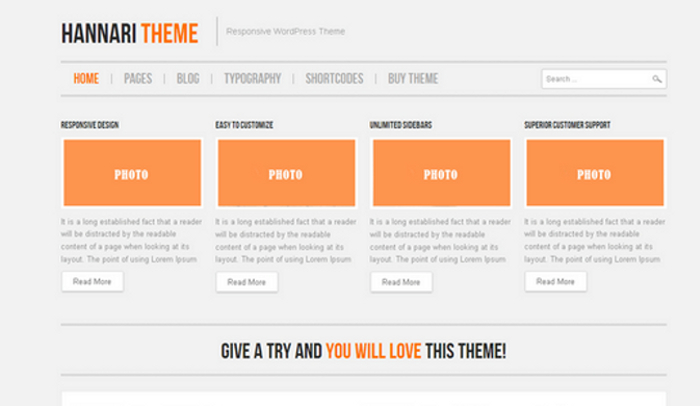 It offers a Theme Options Panel which gives you a lot more customizable options then most themes. It is a great choice. There are many different choices when it comes to themes for your hair salon site that WordPress has to offer. Any business theme that offers a portfolio feature will work to get your business noticed. WordPress can be a real asset to your business and your website.